How to Create HEC-RAS Cross Sections from Elevation Grids (DEMs)? Elevation grids, sometimes called DEMs (digital elevation models), are commonly used to represent ground terrain surfaces. Elevation grids use a fixed grid cell size to create a raster heightmap (a grid of squares) in which each cell stores the corresponding ground elevation. An illustration of this is shown below. To save storage space and memory, many elevation grids store only integer values (i.e., 1217) to represent the ground elevation rather than floating point values (i.e., 1217.42). Integer numbers require 2+ bytes for storage, whereas floating point numbers require 4+ bytes. However, using integer values can cause the elevation grid cells to have an elevation error of ± 1 foot (or meter) when compared to using floating point numbers. 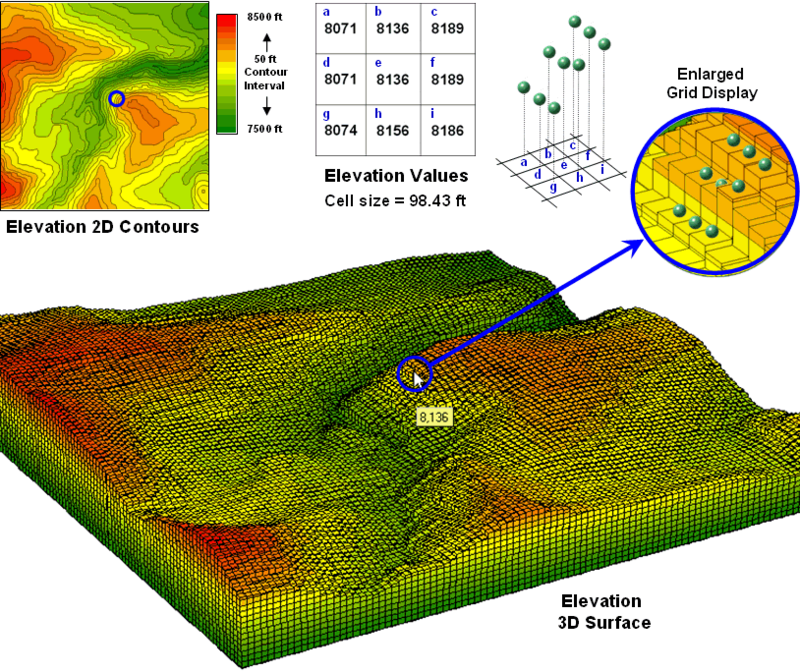 Further, the method by which the elevation grid data is sampled from the underlying terrain surface can introduce additional error for the stored elevation values. With the advent of LIDAR remote sensing technology that measures terrain elevation using lasers, additional precision can be incorporated into the elevation grid by using smaller cell sizes along with floating point values to store the elevation. However, LIDAR requires additional computing power and memory to process the large data sets that are created. Cutting HEC‑RAS cross sections from elevation grids present their own challenges. HEC‑RAS has a limit of 500 ground points per cross section, and if the cell size is quite small (as can happen when utilizing LIDAR data), the HEC‑RAS cross section point limit can quickly be exceeded. Generally in engineering practice, HEC‑RAS models are constructed from contour data with 2 foot contour intervals (i.e., contours spaced every 2 feet in elevation). Occasionally contours will be tightened up to a 1 foot contour interval to provide higher precision for the extracted cross sections. However, this tighter contour interval is mainly used in flat terrain. All of these items have an impact on the model accuracy, so fixating on cross section geometry with high resolution remote sensing can lead the modeler astray from the other items that may impact HEC‑RAS model accuracy. Therefore, the civil engineer’s job requires he or she to make some simplifying assumptions when constructing HEC‑RAS cross sections. The cross sections should approximate what is measured in the field within a reasonable level of accuracy so that the numerical HEC‑RAS model accurately represents the river geometry and can adequately predict the flooding elevations that can occur along the river. In light of the above challenges, the software uses a variable resolution method for extracting cross section geometry from elevation grids. This method is both computationally efficient and engineering sound. The elevation grid may contain elevation data for a large area. However, only a small piece of the elevation grid is required for extracting cross section geometry. Therefore, the software clips a buffered region from where the cross section is located and processes only this region’s elevation data when determining the cross section geometry. The software then identifies the minimum and maximum elevation contained within this clipped region. It then computes the elevation range (i.e., difference between maximum and minimum elevations). Using the elevation range, it then selects a contour interval from the below table. Using the selected contour interval, the software generates a contour map for the clipped region. The cross section geometry is then determined by intersecting the cross section with the generated contours. This method allows the software to quickly and accurately generate HEC‑RAS cross sections from any type of elevation grid data. In situations where variable resolution cross section cutting does not provide enough detail for the user, the software provides an option to define a fixed resolution when cutting cross sections from an elevation grid. 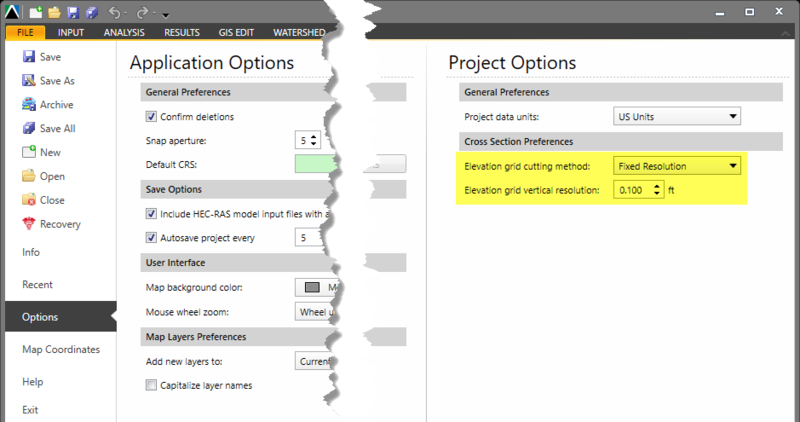 From the Options backstage page, change the elevation grid cutting method to Fixed Resolution and then define the vertical resolution to use when cutting cross sections from an elevation grid.